The Text properties of the Object Information Panel control the font, size, color, alignment of the text in the text box. These settings can be applied to the whole text if the current tool is the Object(Arrow) tool, or to the part of the text (if the Text tool is active). 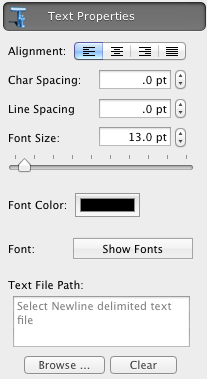 Lists, styles, and spacing attibutes gets enabled when you edit the contens of the text box with the Text tool.